height vrs base diameter for a table lamp ?? I want to try to make a table lamp my wife wants. She wants it taller than the lamps we have now. Nothing gigantic, but something on the order of 24” or 30” from the table to the end of the turned portion of the lamp. The lamp hardware, harp and shade will be above that. I am wondering how big a diameter base I should have on the lamp, sort of the base-to-height ratio. I’m worried about it ending up top heavy and falling over. We don’t have little kids running around any more knocking over everything, but between one klutzy husband and occasionally freaked out cats, the lamp needs to be sufficiently stable. I realize there are multiple factors that probably go into this, but I’m trying to get a basic concept here. Obviously more weight low helps, as would a larger diameter base. From looking at a lot of pictures of turned lamps, it appears that they all seem to have a base diameter somewhat bigger than the widest diameter of other parts of the lamp. Sometimes they have a square base to get to this size, but usually the base itself isalso turned. I have seen very squat lamps, with a very fat lower portion of the lamp, that “neck downs” at the bottom to have a somewhat small diameter foot. My guess is that there is enough weight low on such lamps that they can have the base diameter smaller than the fattest part. If it makes a difference the lamp is not going to be a segmented turning. With the exception of the hole through the middle for the cord the lamp (and base) will be solid wood. The lamp shade will also be an ordinary fabric-over-wire shade, so not much weight there. Am I thinking about this right? In a conventionally shaped table lamp will a base wider than the rest of the lamp work. The shape of the lamp makes no difference, beyond the width of the base. It would matter if your were dealing with a moving object, but this is a static problem. Assuming it is symmetric, the center of mass will be in the middle. Makes no difference how wide it is. As you already mentioned, more mass (weight) lower down make it more stable. There may very well be some standard, but it would be more complicated than simply height to base width as the weight distribution up and down is critical. I’d suggest you mock up a prototype, and play around with it. Get a sense for how easy or hard it is to knock over. My experience with lamps is not some much you knock the lamp as you bump into the end table it is sitting on. It is also common to have weight in the base of the lamp, just to make it more stable. So perhaps incorporate that into your design. Heavy metal or even just sand near the bottom would go a long way to making it more stable. The mock up idea is a good one. I used this during my build of two lamps for my kids. As this was for kids I made sure the base was heavy. 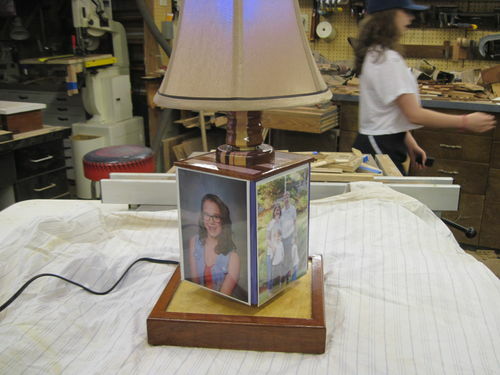 The daughters lamp has a wide square base to accommodate the rotating picture frame cube. Knowing this would be played with I overbuilt…. LOL For my sons I used a drum from a transmission at work, plenty heavy at the base. 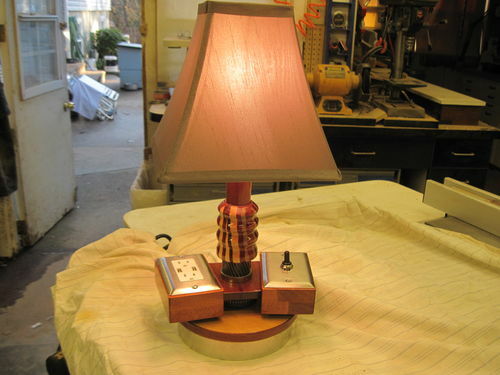 You have all kind of parts can add to the base of a lamp to keep it from being knock over. Lot has to with design and your personal choice. You can also improvise and use your imagination like previous posters mentioned. You can buy metal cast metal stands winch will increase height of the lamp. Or buy clear acrylic, cast brass, or steel lamp bases which are internal at base of the lamp. These cast iron loades are the best internal parts for base for any floor or table lambs. If look at my pine lamps on my project page, none have any of those components. Except for neck part hollowed out other parts hoping the thicker longer base would be enough and it worked out for the most part. Think could have used cast iron loader for more stability. thanks everybody…this is exactly the discussion I was hoping for ! You folks are really helping me think clearly about this issue. Wildwood; the loades are a great idea! I never knew such things existed.. They are at the top of my idea list right now. You can also use weight lifting plates that should be much cheaper than the loader weights. 2.5 lb weights should be around 5” in diameter. The only difference is that there is no channel for the power cord.